Through a partnership between Bauer College and Zimbabwe’s Rydings College, five high school students participated in the EXPLORE Entrepreneurship Summer Institute in July. 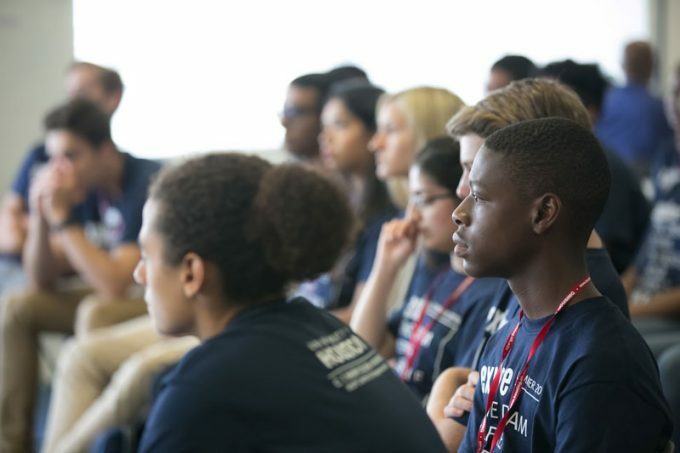 Through a partnership between Bauer College and Zimbabwe’s Rydings College, the students participated in the EXPLORE Entrepreneurship Summer Institute alongside 40 top high school students from the United States. Led by students, faculty and staff from Bauer’s nationally ranked Cyvia and Melvyn Wolff Center for Entrepreneurship, the weeklong annual camp gives participants a CEO’s perspective on launching a business from the ground-up through experiential learning activities, including development of and implementation of their own startup ideas. Wolff Center director Dave Cook strategically began making global connections for the program in 2014, after benefactor Melvyn Wolff issued a challenge to him. “He said, ‘Dave, you’ve figured out how to change the lives of the students in the Wolff Center, but what would really be great is if you could take the lessons of WCE and spread them beyond the walls of Bauer and UH,’” Cook said. In 2016, Cook had the opportunity to take 24 Wolff Center students to Japan with Bauer College Associate Dean for Undergraduate Programs Frank Kelley through a partnership with the Kakehashi Project, Japan’s Friendship Ties Program run by the country’s Ministry of Foreign Affairs. The students learned firsthand the relationship between Japan and the United States as well as the country’s agricultural trade and economy, manufacturing and entrepreneurial opportunities. They also experienced Japanese culture, customs and cuisine. “What emerged from this trip was a strong conviction in the value of travel in shaping the lives of students,” Cook said. Since then, travel has become part of the Wolff Center student experience, with trips to Silicon Valley and Wall Street, along with an annual trip to Omaha to meet Warren Buffett at Berkshire Hathaway headquarters. Last year, Cook and Kelley began exploring the idea of allowing aspiring entrepreneurship students from across the globe to come to Houston for the EXPLORE Entrepreneurship Summer Institute. They met with Rydings College Headmaster Jona Kondo, who was interested in exposing some of his 200 intermediate and high school students to entrepreneurship. “Zimbabwe suffers from a 95 percent unemployment rate, and Headmaster Kondo’s hope was that WCE and Bauer College might have some ideas on how to inspire his students and make a difference in his country,” Cook said. Earlier this month, the Zimbabwe students arrived in Houston, greeted with an on-campus reception with members of the campus and city community to welcome them. Through the camp, they created dream boards, crafted business plans, toured corporate offices and got advice from seasoned entrepreneurs, all before presenting their own startup ideas. “This partnership, which brings together Wolff Center students with participants from across the country and students from Zimbabwe who have an intent to change their homeland, lives up to Melvyn’s hope that the values and lessons taught in the Wolff Center will flow out into the world beyond the walls of Bauer,” Cook said.